It is billed as his farewell address, but President Barack Obama isn’t missing an opportunity to fundraise for his fellow Democrats with his speech Tuesday. Then came the fundraising pitch. “I hope you’ll remember that progress isn’t always a straight line. We will have to work harder now, more so than ever before, to keep our country from moving in what we know is the wrong direction. So I need you to step up, Derek. Pitch in $3 or whatever you can to help Democrats protect our progress,” the email continued. It was then followed by links to donate various amounts of money. The speech, happening in his hometown of Chicago, is taxpayer-funded, as it is an official presidential speech in which he will lay out his view of his accomplishments and lay the groundwork for his legacy. The cost to operate Air Force One is estimated to be $206,337 per hour, and a flight from DC to Chicago is roughly 2 hours each way. This makes the estimated cost to fly the President to Chicago and back $825,348. Taxpayers will pick up the tab for the flight because, in spite of the president using the event to fundraise, the event itself is considered an official job function. Presidents George W. Bush and Bill Clinton followed tradition and gave their farewell addresses from the White House. 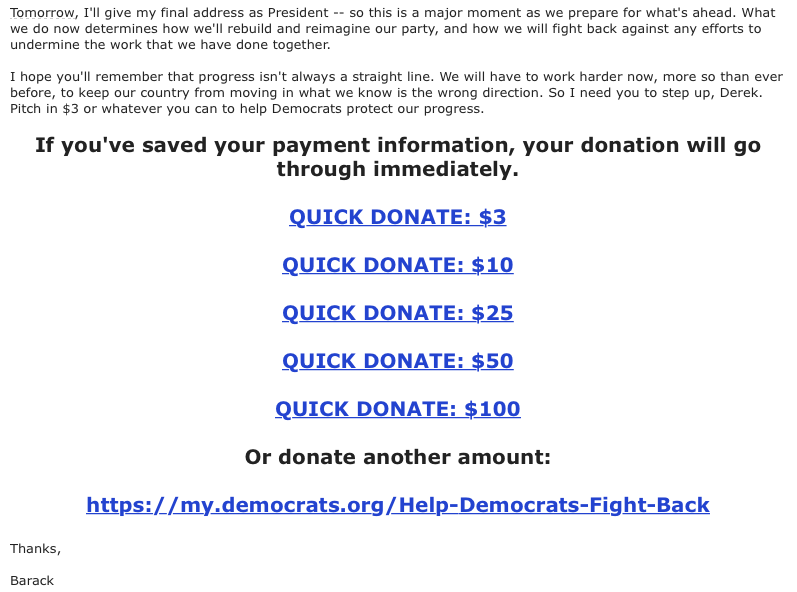 Below is a screen capture of the fundraising email from the Democratic National Committee. Screen capture from DNC fundraising email.